Thanks to Darryl and Thao for creating the signage! A reminder that extended library hours begin this Sunday night at midnight (technically Monday). Hours are posted on the web – check the hours here or type go/hours in your browser address field. Students will need their MiddCards to enter the Main Library after 11 pm and before regular opening hours. 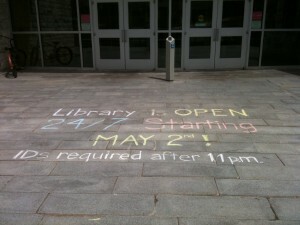 Main Library – 24/7 hours are effective the last week of classes and the exam period 5/4 – 18 for MiddCard holders only. Music Library – regular semester hours are in effect. Armstrong Library – extended hours during exam weekend 5/15-17. Exam schedules coming up soon! Just a reminder to everyone that exam time means a few changes in library hours and staffing, less if you’re at the branches, and more if you’re at Main. Here’s a link to library hours for exams for your edification, and for when patrons start asking about extended hours. Just to hit a couple of the high points for this Spring: Yes, the Main library will be offering the same 24/7 schedule it has in the past, from the last week of classes through the end of exams. Access to the building will be by Midd ID card only after 11pm all nights. (Main library students: a heads-up that the sign-up sheet for exams hours – overnights as well as shifts during the day and evening – will be available on Thursday the 23rd.) We will have both students and a security presence on shift during the overnights. Armstrong will be offering extended hours on the weekend of exams, and Music will be keeping the same hours as they usually do. If anyone has questions, please ask your supervisor. Thanks for helping us staff the library desks at this hectic time of the year! 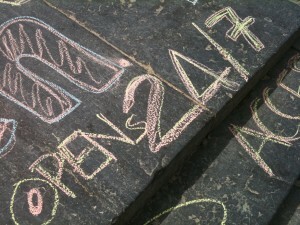 Please post your thoughts about 24/7. What should we consider for next semester? What worked well? What did not?